Shelton, CT — June 23, 2017 Vibrant Health® is proud to announce that all three pet products offered by Vibrant Companions received a 2017 Family Choice Award. Now in its 25th year, Vibrant Health specializes in bringing the highest quality health supplements to the market for men, women, and children. In 2015, the company established Vibrant Companions to bring the same level of quality, integrity, and benefit to pets. 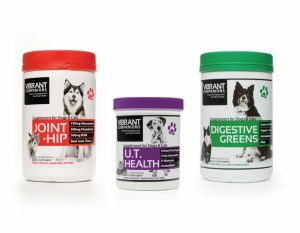 The line currently offers three products to target the most common pet ailments: Joint+Hip, Digestive Greens, and U.T. Health. The “Family Choice Awards” recognize the best products in a variety of categories, including pets, children’s and parenting. It remains one of the most coveted consumer award programs in the nation for family friendly products. Joint+Hip combats joint degeneration, common in some larger breeds of dog and older cats. The comprehensive formula promotes joint cartilage growth, flexibility and mobility while combating joint pain in the process. The formula is derived from Vibrant Health’s dietary supplement, Joint Vibrance. Joint+Hip has been adapted for pets with adjusted doses of ingredients and the flavorful addition of powdered beef liver. Digestive Greens is formulated to provide high fiber greens and grasses to support digestion and provide antioxidants. Dogs and cats naturally graze on grass or munch on houseplants to get chlorophyll into their diet, which is incredibly beneficial for their health. These days, many of our pets don’t get access to fresh, pesticide-free grass. Digestive Greens contains organic and raw greens. U.T. Health is designed as a crisis intervention solution for urinary tract issues. Cats and smaller dogs are particularly prone to infections. U.T. Health is a natural healing alternative featuring D-mannose (to eradicate E. coli) and antioxidant rich botanicals to support and restore urinary tract health.